In a couple of weeks I'll be going on a family vacation to Vancouver, Victoria and kayaking with whales. Anybody have some good recommendations for Vancouver or Victoria? Tonyg has just spent a month working out there and keeps gushing about some places - let me email him and see whether I can rouse him to a reply. Miko and Sun Sui Wah were fantastic. Sun Sui Wah especially. Don't miss this place for chinese in vancouver, and don't miss chinese in vancouver. So, yeah. Lamb dry and overcooked a lot of the time. Round was wonderful, flavorful, but didn't come along much. Sausages - Not hugely high quality.. texture was off..
$16CDN incl tax+tip. You get what you pay for. It's been a couple years, but I remember going to Joe Forte's when I used to frequest Vancouver on business. It's downtown, and has a wide variety of fresh seafood, especially clams, mussels, oysters, and crabs. Also a nice, upscale bar. You can eat well there for not an insane amount of money, but admittedly it's not cheap. Best when the Canadian $ goes back in the dumper. There is a nice salmon restaurant across the bridge in West Vancouver, that's also a bit of a tourist trap. It's built like a mountain lodge, and their specialty is fire roasted salmon on a cedar plank. On the expensive side, but not outrageous. Sort of a salmon equivalent to an expensive steak house. Sorry, I forget the name. Also I remember sushi places along the main drag (Robeson St.?) advertising CDN$1 sushi. When that meant $0.60 a piece, I couldn't get enough. Imagine good, fresh sushi, cheap as a street food. Rich4 wrote: It's been a couple years, but I remember going to Joe Forte's when I used to frequest Vancouver on business. It's downtown, and has a wide variety of fresh seafood, especially clams, mussels, oysters, and crabs. Also a nice, upscale bar. Our visit to Joe Forte's went like this: Joe Forte's is a very loud and busy restaurant that serves some very good seafood. There was a long wait for a table so the wife and I headed to the oyster bar to sit down and dine there. Our caretaker/raw bar man was Oyster Todd (it said so on the check and his name badge). Oyster Todd was a cocky young guy who felt he knew everything about oysters and steered you to his favorites that were in season at the time. There were some varieties that I had not had before and Oyster Todd was not opposed to providing a free sample to sway me to his tastes. He did not disappoint, selections were great. Wife and I both had fresh fish that were done just the way we requested and tasted delicious. Phnom Penh Restaurant, 244 E. Georgia St, serves some DELICIOUS meals. Definite musts are the lemon-pepper fried squid and the seafood hot pot. The squid is tender w/a hint of black pepper that you dip into a lemon sauce. At first bite your thinking "oh fried calamar, nothing special" but then the flavors take over and you realize that this is a very special squid dish. The seafood hot pot is a wonderful hot/sour soup stocked w/seafood and a myriad of tastes, just incredible. My SUSHI EPIPHANY was at Tojo's located at 777 West Broadway. Make sure to bring some coin and have the full Omakase. Lucy Mae Brown was suggested by Conde Nast Magazine as being a "hot" table. "the city's most decadent dining destination, pairing a French restaurant with the Opium Den, a late-night lower-level lounge. ....sampling chef Audrey Durbach's modern French-Mediterranean menu: duck pot-au-feu, sockeye salmon with carrot essence, and local sole with lemon and fresh artichokes." take that for what it is worth. I'm gonna chime in late here, and hopefully Jonah hasn't already left. In one sentence, I honestly believe that Vancouver is one of the world's greatest chow cities. Last time I went, my GF and I went just to go eat. No siteseeing, no nothing....just chowing. I agree with Sweet Willie....if you are a sushi fan, Tojo's is a must. We had the Omakase, and it was one of the best dining experience of my life. No over-exaggeration. For EXCELLENT, REFINED DIM SUM...Kirin delivered unparrallel dim sum. If you thought you know what good dim sum is, and haven't been here....then you probably don't know good dim sum. Better than my Hong Kong experiences. Its off the menu, not cart. If you want cart Sun Suh Wah is good too. But Kirin is by far my favorite. For dinner Sun Suh Wah has the fattest, juiciest live king crab. Be sure to reserve a Squab if you decide to dine there. Gyoza King serves excellent homestyle Japanese food. Think Katsu, but much cheaper. Clams in sake. Gyozas. Grilled Pork Bellies. Completely unpretentious. Usually filled with Japanese transplants missing home. Landmark, if you like hot pot. Fresh seafood, and EXCELLENT broth. Several notches better than the hot pots found in our chinatown. 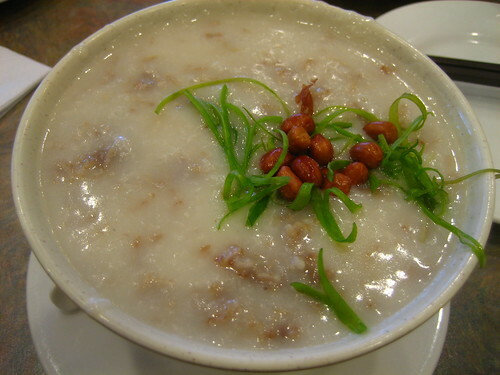 True cantonese dishes that can be found on the streets of Hong Kong can be found at Hun's. Open late at nite. Extremely cheap and good. Avoid Montri's for Thai. Well rated....but extremely bad. Westernized, and done poorly. I even spoke Thai, and requested Thai Thai. In a city of great food, I expected really good Thai. We have much much better here in Chicago. Enjoy! And eat as much as possible!!! I think you can throw darts at the phone book in this city....you can't go that wrong. I am SO SO envious. Other locations too. One on Alberni St., Downtown. Other locations too. One in Chinatown too, I believe. Thanks for all these great posts. I don't leave for a week yet (I couldn't wait to post for recs! ), so any more would be appreciated. Reviving this thread and seeing if there are any other thoughts or recommendations. Thinking seriously about Tojo. Also wanted to see if there are any opinions about West, which seems to be the "hot" place of the moment. I'm going there in two weeks. Interested primarily in cuisine I can't get here and/or distinctively of Vancouver. Went to West about a year and a half ago. Definitely recommended - comparable to many high-end places here, but a little cheaper. All I can offer are hearty seconds of recommendations already provided. Gyoza King, Hon's Wun Tun and Pink Pearl for dim sum. Also make an effort to check out the market at Granville Island. Of particular interest there is a bakery making some incredible foccacias and a deli counter with an impressive collection of salamis and proscuittos not seen many other places. Walking up and down Robson, while a heavily trafficed touristy area, there are many excellent choices. Also try to make it to Commercial Drive for sort of a hippie vibe but with many casual options including multiple gelato stands and a few Portuguese places. If you are in the mood for an excellent shwarma and feel like a little drive, check out Abdul's in Burnaby. Tiny place but high quality. Not too far from downtown. Our family spent our last two summer vacations in Vancouver (and in Tofino on Vancouver Island, also amazingly good for food, along with stunning scenery, and surprisingly, surfing) and would second the Hon's recommendation, where we ate many great meals. Granville Market is also a place any food enthusiast would want to visit. And, because no one has mentioned it yet, you must eat lots of gelato in Vancouver, because it's so good. Our favorite place was Mondo Gelato -- there's one on Robson, just a black or so from Hon's (and right across the street from the Blue Horizon Hotel, the very nice place we stayed). Also there's a great place in that area for coffee (there are lots of great places, actually, but this was the best) called Latte Art, which had some of the tasties coffee I've had anywhere. The Fish House in Stanley Park has nice fish in a great setting, in one of the world's great parks. Oh, have a great time! I'm getting all dreamy just thinking about being there. I really think Vancouver is an under-rated food city. You rarely hear it mentioned in foodie conversations, but there are a lot of exciting choices. Had a great time in Vancouver. A couple of additional suggestions to the ones listed. I heartily recommend Okada Sushi--great fish, low key atmosphere, very hospitable service, reasonable prices, about $80 CDN for a LOT of sushi for two (waitress suggested I might have over ordered) and a couple of drinks. Had what I think was albacore toro that was sublime. It also happens to be close to the downtown hotels. Also recommend Go Fish, a fish shack of sorts on the outskirts of Granville Island. Exceptional fish (especially) and chips. Also went to Rodney's Oyster House, a sort of faux casual oyster house in Yaletown. Didn't love the atmosphere, didn't hate it either, but the oysters were excellent. I'd go there if I were in Yaletown again but wouldn't go out of my way for it. My family really enjoyed a place called Cardero's in the harbour. It's owned by a restaurant group (sort of like Lettuce Entertain You, but much better), they also have a place on Granville Island which is quite good. Lots of good fish. The Chef and the Carpenter is also really good. It's on Robson, I think. It's usually pretty packed. There's also this really good fish place which we were at once and can no longer find, but it was really good too. =) I think those are some of the highlights of the places I've been too. How does Stepho's compare with the Greek fare in Chicago? Vancouver is a wonderful food destination. Thanks for all the suggestions above and from the link to extramsg. The weather was gorgeous, mid 70s and sunny most days. This is a good time of year to visit the Pacific Northwest. For dim sum on Friday afternoon, we had a very good meal at Kirin Seafood on Alberni Street. We had the soft shell crab, steamed pork ribs with gourd in black bean sauce, prawns with peashoots dumplings, pork dumplings, and shrimp and fungus shumai. The pork ribs with gourd (pumpkin or acorn squash) seem to be a Vancouver specialty since the pork ribs at Jade Dynasty (Dim Sum on Sunday) also came with pumpkin. We could not detect the Black Beans, but otherwise they were very tasty. We also couldn't detect the fungus in the shrimp and fungus dumplings, but the shrimp and prawns were plump and fresh. I think the prawns with peashoots was my favorite as I liked the greens and seafood. The softshell crabs were small and spiderlike, but deliciously prepared (salt and pepper, lightly fried). We worked off this meal with a bike trip around Stanley Park, where we saw this seagull also enjoying a little dim sum. In case you can't tell, he is eating a starfish. We visitied Vij's and think its best not to compare this with Devon. It is indian-inspired more than Indian, and decidedly upscale. We arrived 15 minutes before opening and although the line was pretty long we were seated in the first seating. They bring complementary chai and puri, and then a bit later some french fry like things (seasoned, fried starch). We had the jackfruit and greens appetizers. The jackfruit with black cardomom and cumin masala was an amazing experience. 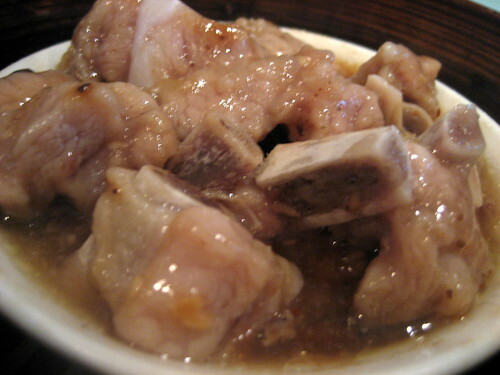 It was cooked until it was very tender, and the large fibers gave it pork shoulder like texture. The curry it came with was exceptional and the most strongly indian tasting dish of the evening. The greens (sauteed rapini) were not quite the saag taste I was craving, and contributed to our feeling that most dishes were underspiced. However, both dishes were still very good, and both plates were cleared of all sauce before leaving our table. For the main course, we had the lamb tenderloin in mushroom cream sauce (technically a pistachio and spice encrusted tenderloin with porcini cream curry and eggplant fritter). The spice profile was low, and this reminded us of veal in mushroom sauce dishes we had in Bavaria last summer. This is not a bad thing, we soaked up every last drop of this cream sauce with the spongy, almost injera like naan that was served (and readily replenished) with our meals. What's not to love about mushroom cream sauce? The crunchy eggplant fritter was also a nice juxtaposition. Just saying that there really was not an indian profile to this dish. The grilled venison with date and eggplant puree served on ginger, lemon and cumin sauteed vegetable was our second entree. The vension was grilled perfectly although the flavors of this dish didn't come together to the same extent as the others. To accompany the meal, Vij's serves Storm Brewing Beers. We had the Scottish Ale and it was dark, malty and very refreshing. Then, on our way to the train station on Sunday we walked through Chinatown and stopped at Jade Dynasty on Pender Street for some late dim sum (served on weekends until 4). We had pork shumai and shanghai dumplings (also pork filled), turnip cakes, taro balls stuffed with bbq duck, and gyoza with shrimp and some kind of greens. The shumai came in cabbage leaves instead of noodles and topped with roe. The meat was quite dense making them similar to pork meatballs wrapped in cabbage. The taro paste balls were sweet and the duck was a nice treat in the middle. They were fried in light flaky crumbs, and were a little greasy on the outside. Unforunately our conference (the reason for the trip) prevented us from a full-on foodie experience, but we are primed to return! We did find a decent beer destination -- the Railway Club, at 597 Dunsmuir. We also tried Dix BBQ (which is a brewery, food was ok but expensive for portions, beer was decent) and Steamworks (brewery, your basic corporate micro beer) and we recommend Railway for having the nicest selection of microbrews on tap and old timey ambiance. Tree Hophead was a nice IPA, hoppy as you might expect. They also had Unibroue Blanche de Chambly on draft, which is a refreshing wheat beer especially in the height of summer. This an addendum to my Wife's post above about our Vancouver trip. Wow! What a truly spectacular selection of fruits and vegetables, but also smoked meats and cheeses. There was a stand with a woman selling about 10 kinds of Goat cheese, and I tried a taste of most of them before settling upon one with a white mold rind that was kind of like a pungent goat brie(top of picture below). Oyama Sausage had the most amazing array of meats I have seen. The combo of cured, smoked, dried, and raw meats and sausages, plus several pates must have numbered close to 100 and spanned across about 10 animals. – One nice thing is that they price things per 100 grams and have no problem giving you 100 grams, which allows you to try many things. The first visit we tried the lamb prosciutto, duck prosciutto and wild boar spicy sausage. We grabbed a sourdough baguette from Terra and took our haul out onto the riverside deck for a picnic. Everything was excellent, though the high spice of the boar made it hard to notice any difference than if it were ‘mere’ pig. The duck and lamb proscuitto got increasely tasty as the warm sun heated them up and their fats began to melt. After our picnic, we grabbed a pint of wonderfully plump, ripe and slightly tart blackberries to snack on as we strolled around the rest of the island and visited the two nearby brewpubs. Dockside Brewing is definitely the better of the two and their beers are not available anywhere else but the pub. On a sidestreet not part of the official market, there is a warehouse where you can by live lobsters(a few types) and almost a dozen types of oysters (below left). They don't shuck there, so bring your own knife. Some were as cheap as 70 cents each. Before leaving I stopped back at Oyama and grabbed some dried mutton (right above) sausage and dried venision “stick” to take with us. The mutton was particularly dense and intensely muttony with pungency from the white mold on the rind. We went back 2 days later. We got some smoked white Albacore tuna loin and smoked candied salmon from Longliner Seafoods a couple of stalls south of Terra breads. Back at Oyama, I tasted slices of Elk salami and Caribou salami which were both good salamis, but not different or better tasting than quality salamis we can get in Chicago. So, instead we purchased more lamb proscuitto, plus two pates, Foie Goie with truffles with pistachio, and Venison liver with cranberries. The first had uncommonly large pieces of black truffles, whole pistachios, and chucks of what might have been tongue. It was the best pate or any kind of pureed liver we had ever had. The vension pate was also very very good. The Tuna (top below) was as good as the best smoked sturgeon we have had. Not a whiff of fishiness. Sweet, buttery and melt in the mouth hickory smoked fish. nice view of the market from overhead, as well as the mountains behind the city, but once was enough. So on the way back, we took the water taxi for 2.50 to the bottom of Hornby street. thanks so much for these excellent posts. I'll be in Vancouver in October and I can't wait to go to the market and try some of the Asian places. Beautiful pictures! The Elbow Room Cafe serves great breakfasts, excellent sandwiches, and the best cheeseburgers in BC, topped with the finest abuse in Vancouver. For the dining experience of a life time, be sure to request Patrick as your waiter. Last edited by chicagostyledog on December 22nd, 2007, 7:12 pm, edited 1 time in total. chicagostyledog wrote: The Elbow Room Cafe serves great breakfasts, excellent sandwiches, and the best cheeseburgers in BC, topped the finest abuse in Vancouver. For the dining experience of a life time, be sure to request Patrick as your waiter. Hungry Rabbi, Patrick dishes out more abuse than most are prepared for, and I'm not talking schtick here. I'm talking X-rated, bad to the bone. This is not a place for families with young children. It's not the typical old style Chicago deli waitress attitude or the acting at Ed Debevic's. Those easily offended or embarrassed, shouldn't come near the place. It's not a gag, it's the real deal. He makes the dearly departed Booby from Niles look like a novice. Those atttempting to banter back, will end up with their tail between their legs. We absolutely love Vancouver. We've considered it one of our three destinations for relocation in the near future(all are in the Pacific northwest). Another wonderful place in Vancouver is La Casa Gelato. www.lacasagelato.com Over 200 flavors! If you want to talk Vancouver in detail, kindly send a pm. I was in Vancouver last week and tried to squeeze in some serious chowing before the work-related stuff. First of all, inspired by PIGMON’s massive post on xiao long bao, I was determined to have some soup dumplings while there. Research on Chowhound and elsewhere suggested that the very best spots for Chinese food these days are not in Vancouver proper but rather in the suburb of Richmond, just south of the airport. I therefore resolved to go straight from the airport with my luggage (I pack light) to Shanghai River. WOW. These dumplings were a revelation. I had only had soup dumplings before in Chicago, and I enjoyed them (as I do all sorts of dumplings), but now I see what xlb are supposed to be like. The wrapper was thin and delicate, but held together perfectly Each dumpling had a generous amount of soup, and both the broth and the pork filling were deliciously flavored. They were great. 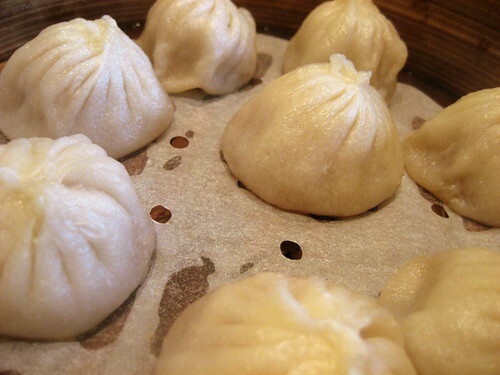 An order of 8 xiao long bao at Shanghai River was (Canadian) $6.15, not too bad. However, from another point of view you might say that these were the world’s most expensive xiao long bao, since I spent $21 on a taxi ride down there and $32 on the taxi from there to my hotel. Man, the taxis in Vancouver are expensive! And the U.S. dollar is weak… Oh well, I’m glad I did it. Really fabulous dumplings. I also got scones for breakfast the next day at Terra Bakery and some good coffee so I wouldn’t be at the mercy of the hotel’s mediocre brand. Unfortunately the remaining days in Vancouver my conference schedule precluded shopping at the food market again. (The market is open 9 to 7.) But it was still fun to be staying right on the water for great views both in the morning and coming home at night. Vancouverites posting on Chowhound routinely recommend Guu with Garlic, an izakaya in the West End neighborhood of Vancouver. There are three Guu restaurants – this “garlic” branch is said to be the best of them. So that’s where I headed my first evening in town, taking the little ferry boat across False Creek. The place is very small and extremely popular. I went early and got a seat at the bar; by the time I left there was a sizeable line outside of folks standing in the rain till they could get seated. Izakayas, as I understand it, serve food that goes well with drinks, including a lot of deep fried items. I don’t know if all izakayas are as loud and raucous as Guu is, but the atmosphere there is wild, because the staff are continually shouting. You order something and the waitress or waiter yells out your order in Japanese and the cashier and the cooks all yell it back. Then when the dish comes up the cooks shout again to announce it… wish I could give you a soundtrack of my meal there. There was also a TV screen showing Japanese cartoons but with the sound off (I think). The portions here were described as tapas-like and I decided to order just three things, with the idea that I’d go afterwards to Mondo Gelato (recommended above by ToniG) for dessert. Unfortunately, even though I was there early they were already out of one of their specials that had caught my eye, “deep fried bacon and avocado rock and roll”. Too bad! I ordered bonito tataki, tori-karaage, and grilled saba. I believe this branch of Guu makes a point of serving garlic with everything, and the bonito had slivers of fresh ginger and of raw garlic on the side. 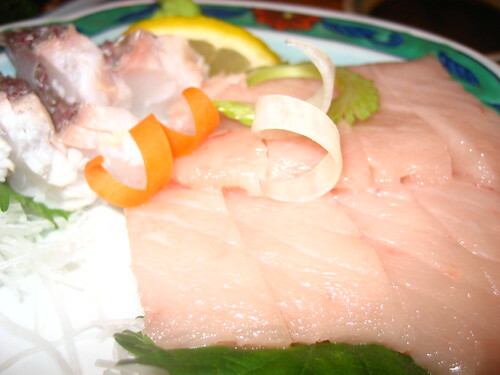 Very delicious, perfectly fresh fish. Then came the tori-karaage, deep fried pieces of boneless chicken thigh meat, with aioli on the side. This was SO good, maybe the best fried chicken I’ve ever had. As I liberally dipped my pieces into the garlic mayonnaise I began to realize that this wasn’t exactly a light meal I had ordered. This was a very generous piece of grilled fish on a bed of onions, topped with diced tomato, a sprig of dill, and a big handful of sliced garlic, fried crisp. I put aside my chicken to eat the fish while it was hot, and it too was great. I was so full, though, that I couldn’t finish the last chunk of chicken. Gelato afterwards was out of the question. I definitely recommend Guu with Garlic to anyone going to Vancouver. The prices are very reasonable too: my three dishes were $21-something before tip. I wish there were an izakaya like that here in Chicago! 110 - 7831 Westminster Hwy. finally going back to Vancouver at the end of January, I do plan to hit Tojo's again to see if it can live up to my experience there. I've also enjoyed reading about the other suggestions, any recent ideas/experiences ? Just got back from a belt-busting trip from Vancouver over the xmas week, it was nothing short of spectacular series of meals. I did not see this thread prior to my trip (doh! ), so some highlights will be from places that was already covered previously, but obviously, based on my experiences there. I can confidently say that it served just as good if not better soup dumplings than what I've had in China, and definitely more moist than the ones I've had at Din Tai Fung LA branch (flavor is different slightly, not sure exactly how, but just is, and I like both equally). Another huge win for myself is the You Tiao and Dou Jiang (Fried dough and soybean milk) here is by far the best I've had in N. America, and I mean by far, even better than couple other places I tried in Vancouver on the same trip. 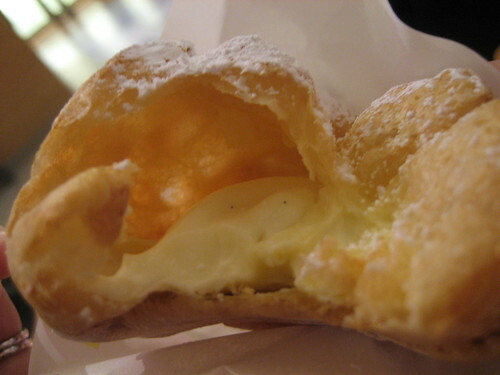 It simply reminded me of the ones I've had in China and my child hood there. This is northern-China style breakfast (not to be confused with Cantonese style Dim Sum). The biggest surprise of the day was the fried bun (not to be confused w/ the fried dough I mentioned earlier) w/ condensed milk. Surprise being that I've never had this in China or anywhere in US. It seriously kicks Crispy Cream's behind (IMHO, and no pun intended for those CC aficionados). I liked the dish so much that I ordered it at every Chinese places we went to rest of the trip that served it. Kirin gave us the most proper Cantonese style dim sum. Spare ribs were done perfectly, sticky rice wrapped in lotus leaves was moist and juicy, but not fatty, shrimp dumplings were plumb and moist. We had quite a few dishes and the overwhelming consensus were that EVERYTHING was done "right". This is a huge difference to the dim sum I've had in Chicago as I've had the same dishes in so many places, but having everything served in front of you being consistently good is just impossible to find in Chicago. Interesting enough, one of the better dish I had there was the Shanghai noodle style noodle soup (which by definition, isn't exactly Cantonese). Guu was loud and comical to certain degree as the yelling match between the waitress and cook staff progresses throughout the night. Food was great, but I've had similar if not slightly better level of izakaya in Chicago. We went to a more proper Sushi-oriented Japanese place later on the trip, Aki. We ordered various Yakitoris, Sashimi, grilled mackerel, grilled snapper head, one roll (namesake BC Roll) and couple of chasuke to finish the night off. Everything there was good, but I can have just as good of stuff in Chicago, albeit not in the same location (i.e. Katsu for sushi, Kurumaya for the more izakaya items, etc). The lone standout dish was the o-Toro and sea bream sashimi that just melted in our mouths, just beautiful. We also went to a local Congee chain (3 locations I believe, just like Guu) called Congee Noodle House that served some of the best Congee I've had in a long while (last good one I had was in SF's Sunset district). A hole-in-the-wall kind of place from the outside, but once inside, you can hear all the congee slurping, it was just a great atmosphere if you are into Chinese Congee. Also served great Peking duck on rice as well. Their shrimp wonton that came w/ some of their noodle dishes were some of the biggest ones I've ever seen (I think 3 shrimps were wrapped into a single wonton). It was so good I thought about opening my own francise here in Chicago until I saw the $185k-$325K initial investment requirement on their franciseee info page, ha. Finally, to put a little background/context into the group I was with, our group lead/guide was a Vancouver native (Chicago transplant now =) who grew up there and our group included Chinese, Japanese and Korean ethnicities. Last edited by fenger on January 3rd, 2008, 1:57 am, edited 2 times in total. fenger, thanks for the great report and photos. I'm envious of your visit! Food was great, but I've had similar if not slightly better level of izakaya in Chicago. What are the izakayas around here that you'd recommend? Thanks. Amata wrote: fenger, thanks for the great report and photos. I'm envious of your visit! My favorites are Kurumaya and Sankyu, both in the Arlington Heights/Rollowing Meadow area of the suburb. Their regulars tend to be very much Japanese biz folks, thus their daily specials are typically written in Japanese on a board (they don't change much though day-to-day). I would recommend either bring a friend who can read Japanese or have the waitstaff translate it for you (maybe a little tedious since the list is about 20-30 items). Kurumaya has a very helpful pictorial book on each table that can also help your ordering as well (the items in there are not on the board however, but just as good). I remember seeing a mostly-translated version of the board-special for Kurumaya(or maybe it was Sankyu?) on LTH's Chicago board, you may want to search for it there. any new/other recs? i'll be going fairly soon. Vancouver is a fabulous dining city and, really, just a fabulous city period. I had 2 wonderful dinners at Blue Water Cafe, which has one of the finest raw bars I've seen, as well as some creative and delicious seafood preparations. 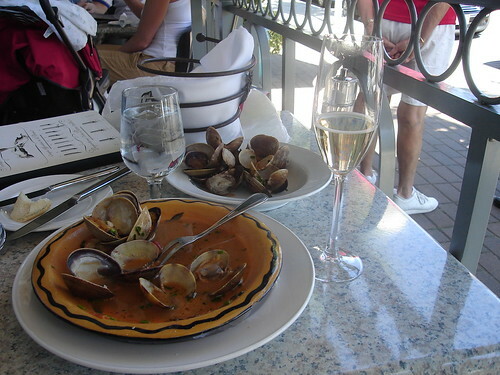 I also had a very nice lunch of pristinely fresh, garlicky clams accompanied by good bread and some terrific people-watching while sitting outside at Provence Marinaside.